Hadrian VI proved to the last non-Italian pope until the twentieth century, but his place in the Reformation is most noteworthy because of both the high hopes for his tenure and its remarkable brevity. Born Adrian Florensz on March 2, 1459 in Utrecht, he received his early education among the influential Dutch Brethren of Common Life before matriculating at Louvain University in 1476, where we would spend the next three decades. He earned a master’s in 1478 and a doctorate in 1490 before joining the faculty as professor in 1491. He twice served as rector and from 1497 until 1515 he was chancellor of the university and dean of St. Peter’s in Louvain. A moderate scholastic theologian, he wrote little and was only published later by his students. In 1507, however, Hadrian received an appointment that would have a decisive influence on his election as pope when he was named tutor to the precocious future emperor, Charles V. Appointed by then-emperor Maximilian, he taught Charles in Mary of Burgundy’s court and eventually became the young Habsburg heir’s councilor in 1512. To insure Charles’s succession as king of Spain, he was sent to Spain in 1515, where along with the Spanish cardinal Ximénez de Cisneros he brokered the elevation of Charles after the death of King Ferdinand of Aragón. For his efforts, the future pope received the bishopric of Tortosa and was named inquisitor of Aragón and Navarre in 1516, and later inquisitor of Castile and León. He was also elevated to cardinal in 1517 at Charles’s behest. As cardinal, he had intended to return to his home of Utrecht, but diplomatic affairs detained him in Spain, where he served as viceroy from 1520 until he was elected pope in 1522. Hadrian was a compromise candidate for the Roman see and his election came as a surprise. Due to both the religious complexity of the Reformation and the ongoing political tensions between the Habsburg and Valois lines, the conclave had split over Leo X’s successor when Hadrian emerged as a candidate, owing partly to his standing with Charles. 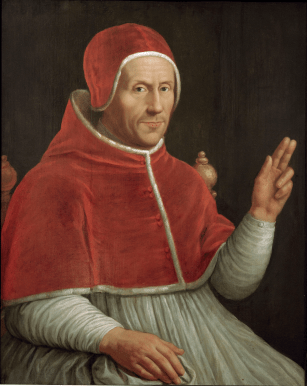 The cardinals elected him unanimously on January 9, 1522, but because he was not a resident in Rome the future pope did not receive word of his nomination until February 9, and then accepted a month later. He did not finally arrive in Rome until August 29, 1522, with his coronation held on August 31, 1522. This protracted eight-month timespan between election and coronation foreshadowed the problems he would have in Rome during his short pontificate. A stranger both to the Roman curia and to the Italian people, he was regarded as a “Barbarian” for his Germanic roots and an outsider to the ecclesiastical bureaucracy which he would seek to reform. He was not a patron of the Renaissance arts, as many of his predecessors had been dating to the middle of the fifteenth century, but a professor and theologian who targeted abuses within the curia before he had even arrived in Rome. The new pope announced his agenda in a speech delivered a day after his coronation. He had two main aims for his pontificate: to reform the church in response to the problems associated with the growing Protestant Reformation, and to unify Christendom against the threat of war with the Ottoman Turks. Hadrian had little sympathy for the early Protestants. He condemned Luther’s theological opinions while still a cardinal in Spain and he supported the 1519 condemnation of Luther’s teachings by the Louvain faculty. He had pressed Charles to have Luther subject to an ecclesiastical trial before the Diet of Worms, and after the May 1521 Edict of Worms was published he urged that it be enforced through his legate at the 1523 Diet of Nuremberg. Despite his opposition to Luther and the Reformation, Hadrian remained convinced that blame for the Reformation fell on the unreformed curia. In February 1523, he established a commission of cardinals devoted to reforming curial abuses. He immediately began curbing some of those abuses, such as the lucrative benefices handed out to members of the curia or the curia’s secularizing with concerns of political affairs. Predictably, the resident cardinals opposed his measures and he was forced to rely on a small coterie of supporters. Moreover, his pontificate was hamstrung financially due to the debt accrued by the lavish expenditures of his predecessor, Leo, which only compounded internal problems and made reform difficult. The new pope’s problems reforming Rome paralleled his similar struggles in presenting a unified front against the Turks. With the Turkish victory at Belgrade in 1521, it had grown incumbent upon the Western church to fortify itself against the threat of further incursions, but the ongoing rivalry between the Habsburg Charles V and his Valois rival Francis I, the king of France, prevented that. Hadrian chose neutrality in the conflict between the two sides, which evoked criticism from his former pupil, Charles. His relationship with the French crown grew tense, however, when he declared a three-year truce on Christendom in December 1522, and when he arrested a cardinal suspected of conspiring with Francis. France then cut off support for Rome, forcing Hadrian into a defensive alliance with Charles, England, Austria, and Milan in August 1523, further dividing those he had hoped to unite. Despite his promising selection and the early hopes of his pontificate, Hadrian died on September 14, 1523, little more than one year after arriving in Rome to take the papal tiara.